READ THIS , FORGET THE REST OF THE REVIEWS!! 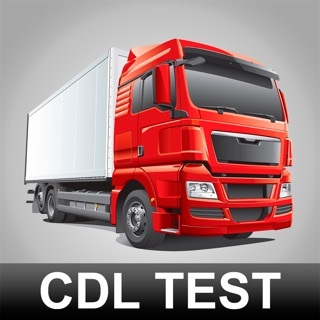 Yesterday 3/3/18 I’ve PASSED my CDL Learners Permit thanks to this app. I was on a different app recommended by my agent called “ CDL Prep “ w. a picture of a steering wheel. In all honesty it’s a nice app it helps but I promise you it won’t be as organized & mesmerizing as this app. Literally it has sections of what you want to learn i needed 1. General knowledge 2. Air Brakes 3. Combination each of those had “7 levels” level one would have 6Q level two would have 12Q and each right or wrong answer you chose had an explanation to why was it correct/incorrect I was told if i can fully pass the “ exam “ on that other app, I’d pass; but I didn’t. It was all scrambled of 50Q that didn’t had enough of each subject i needed. 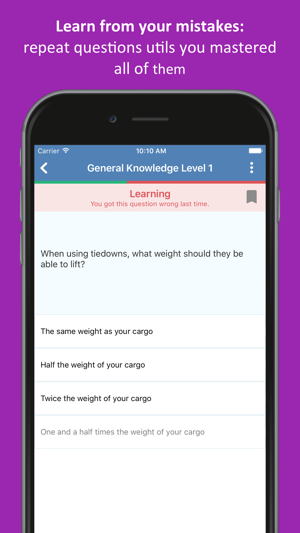 While in this app i took each subject starting with general knowledge learned it all & memorized it. Then air brakes as well as combination and all just stuck in my head. AND LITERALLY THE SAME EXACT QUESTIONS AND ANSWERS ON HERE ARE ON THE PEN DOT EXAM. I have a hard time trusting apps to study but this one deserves my time for a review i could be helping someone a ton more then I’ll ever know. Good luck & Trust the lord. Simply, you learn the required information by answering questions, whether your answer is correct or incorrect you get immediate feedback. Incorrect answers are noted and then asked again 2 to 3 times or more and, you must then answer them correctly before you can move to the next area. In subsequent sections for each area of the CDL Prep I found that when I chose the wrong answers to questions the next time the question appeared the position of the answers had been changed. For example, all the questions are multiple choice, you the pick a, b, c or d. If the right answer was “A” and say I picked “C”, it was immediately flagged and the next screen showed the right answer, that being a and what the correct information had been. The next time I saw the exact same question again, later on in the section, the correct answer was now say “C”. This forces one to learn the correct answer rather than the correct letter on this test. 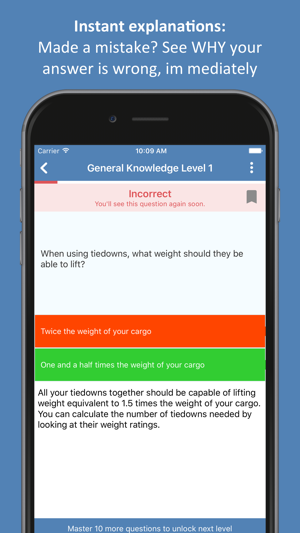 You use this app and you will learn the information given. 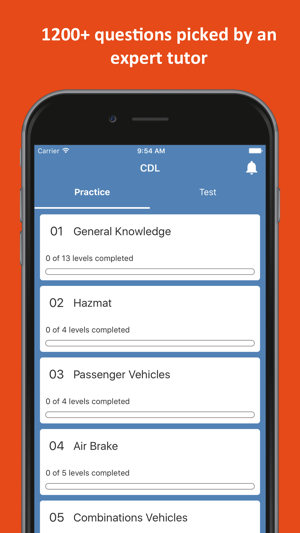 It’s the best way I have seen for augmenting the studying of state CDL manuals. This app is the best!! I had to take my cdl permit test for a job. I attempted studying via the manual and I failed completely. However I was suggested this app by a penndot worker. Let me just say the best thing to ever happen to me. 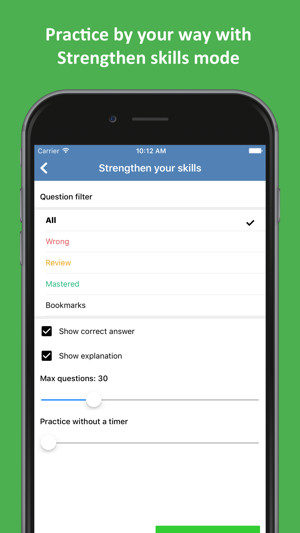 The app is so well organized each testing area has its own section and questions and helps build your confidence. I went home over the weekend studied the questions took them over and over again then. Surprise surprise the questions on the penndot exam were exactly the same I passed with flying colors. 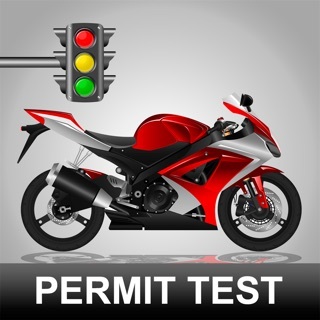 However I will say that for the passenger vehicle exam, a few of the questions were slightly different so the answers may differ from state to state. For example on the app it ask, how many seconds ahead as a bus driver should you look? ( not verbatim) the answer says five seconds. But on the actual exam the correct answer in 12-15 seconds. That particular chapter itself is so short it doesn’t hurt to make sure that answer is right. But I however highly highly suggest this app! Get it and pass your exam today.